Mimika presents a diachronical perspective on a little-known society and culture along part of the southwestern coastal region of New Guinea. Approximately 15 000 Kamoro language speakers inhabit a low-lying swamp intersected by numerous rivers where sago and fish are the basic foods. Traditional Mimika culture was characterised by an almost uninterrupted series of feasts and ceremonies. The inseparability of life and death and the renewal of life constituted the main themes. Woodcarvings, rendered in a highly distinct style, and other objects formed an essential part in the ceremonial proceedings. Deceased persons were represented by human figures carved in huge poles and by ceremonial shields. The latter played a role in the context of a feast in which renewal of life, as exemplied by the initiation of boys, formed the essence. Such feasts were associated with female fertility of which a few magnificent and unique sculptures of pregnant women bear witness. The renewal of life was also expressed by the renewal of material culture needed for such feasts, including the production of canoes, prow ornaments, paddles and sago bowls. The core section of the book is formed by a presentation of the legacy of art and material culture discussed from the perspective of a dynamic cultural context. For the first time a representative selection of this material is rendered in full colour. As Oceanic art specialists have noted, these objects are hardly known outside the Dutch collections (the collection at Cambridge being an exception) and many are published for the first time. Preceding the core section ample space is allowed for a presentation of the historical dynamics and a discussion of the essential characteristics of Kamoro society and culture. The place of Kamoro culture in the context of relationships with neighbouring ethnic groups (Amungme, Sempan and Asmat) is also dealt with. A history of contact is presented with special attention being paid to early expeditions, and reminiscences by Dutch field officers and missionaries, particularly dating from the 1950s. After a period of strong decline of the culture resulting in feasts no longer celebrated and ‘silent drums’ the last few years have seen signs of some sort of revival culminating in a first Arts Festival in 1998. Based on recent eyewitness reports, the book includes a section on the influential role of major external forces (the Indonesian presence and the multinational mining company P.T. Freeport) on Kamoro society and culture. 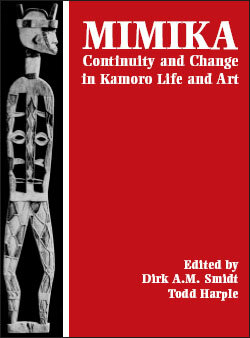 The book, edited by Dirk A.M. Smidt and Todd Harple, benefits from contributions by several experts on Kamoro culture, including noted Dutch anthropologist Dr Jan Pouwer, who conducted substantial fieldwork in the area in 1953-1954, and Dr Simon Kooijman, retired Curator of the Department of Oceania at the National Museum of Ethnology, Leiden, who published an indispensable book on Mimika art and ritual. The more recent developments are mainly taken care of by the American anthropologist Todd Harple, drawing on his experience in the area between 1996 and 1999.